Although fixing the DNS Unlocker ads problem on a Mac is a challenging task to fulfill, this post will guide the infected users away from the adware jeopardy. The Mac operating system is so much safer than Windows in a ton of ways, but its defenses aren’t even close to flawless. To its credit, OS X is strongly protected against malicious code by means of rigorously monitoring what apps are allowed to be installed and run on a box. This feature, however, doesn’t seem too big of an obstacle to malware publishers. The product dubbed DNS Unlocker proves that the bad guys are starting to really succeed across computer platforms. It is, essentially, an adware pest that appears to be quite commonplace on the outside, but a little bit of reverse engineering shows what a misperception this is. Aside from the disruption on a browser-only level, its effect expands over to DNS server settings. The user queries currently trending with regard to this infection include “Ads by DNS Unlocker removal from Mac” and “DNS Unlocker virus”, which indicates that people are mostly annoyed by redundant advertising. Indeed, the virus turns out to be involved in a malicious pay-per-click affiliate model, where software recommendations, deals, best buys, coupons and comparison shopping data are blatantly inserted into every website that the victim visits. Users will also see regular textual elements on pages go capitalized, with hyperlinks being automatically built in. This frustrating activity is difficult to bring to a standstill, because there is some deep system configuration toggling that must be performed. Interestingly, the DNS Unlocker application itself is backed by an idea that would otherwise be commendable. It is claimed to help its customers access geo restricted sites by proxying the metadata associated with one’s actual location. Given this feature, it’s not beyond the realms of possibility that some Mac users install it as an instrument to circumvent sandboxing by services like ESPN, Spotify and the like in places where these are unavailable. Most of the victims, though, get infected when installing free apps with a hidden DNS Unlocker bundle on board. 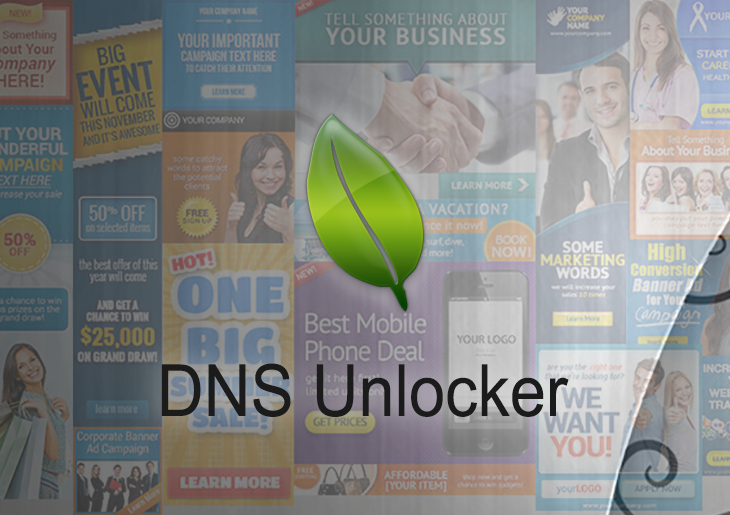 Ads by DNS Unlocker are extremely persistent as they are displayed on all sites regardless of their category. The first and, obviously, correct troubleshooting ideas that come to mind in these circumstances is to trash the application proper and restore the web browser defaults. These actually are on the victim’s agenda, but additionally, some critical values constituting the network adapter configuration should be manually changed. 5. The DNS server address displayed in the respective field should be removed by clicking the "minus" button at the bottom. This being done, the network will automatically assign the correct values instead of the ones previously imposed by DNS Unlocker. When confronted with malicious code like the DNS Unlocker on Mac, you can neutralize its toxic impact by leveraging a specially crafted system utility. The Freshmac application (read review) is a perfect match for this purpose as it delivers essential security features along with must-have modules for Mac optimization. This tool cleans unneeded applications and persistent malware in one click. It also protects your privacy by eliminating tracking cookies, frees up disk space, and manages startup apps to decrease boot time. On top of that, it boasts 24/7 tech support. The following steps will walk you through automatic removal of the DNS Unlocker infection. 4. Check whether the DNS Unlocker virus has been fixed. If the lock screen is still there, go to the Uninstaller option on Freshmac GUI. Locate an entry that appears suspicious, select it and click Fix Safely button to force-uninstall the unwanted application. 5. Go to Temp and Startup Apps panes on the interface and have all redundant or suspicious items eliminated as well. The DNS Unlocker fraud shouldn’t be causing any further trouble.